I think it is safe to say that there are not many eateries in the Lone Star State that make a tortilla burger. I first learned about this burger without buns on a recent episode of The Texas Bucket List. This “everything you should do, see, and experience in Texas” television show is one of my favorites. When I watched the feature on the tortilla burger I immediately added this culinary adventure to my personal Texas bucket list. 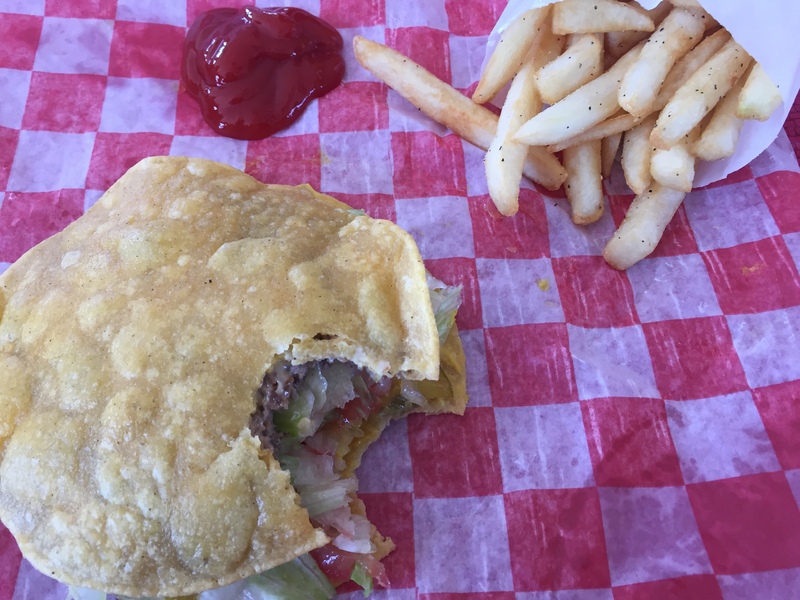 The tortilla burger featured on The Texas Bucket List is served at The Frosty, a 50’s-themed diner located in Woodsboro. The small town of Woodsboro is located at the intersection of U.S. Highway 77 and Farm Road 2441 in Refugio County. Originally named Church, the name of the town was changed to Woodsboro sometime around 1907 after a fellow named Captain Tobias D. Wood, a real estate developer, sold a large ranch property. 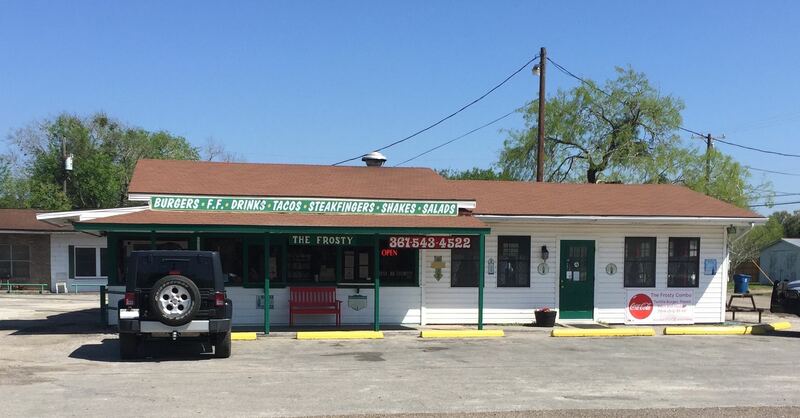 The Frosty is located at 809 Wood Avenue, the same spot it has occupied for years. Over time, previous owners expanded the place to include a small dining area and a drive-thru window. You can also place your order at the convenient walk-up window. 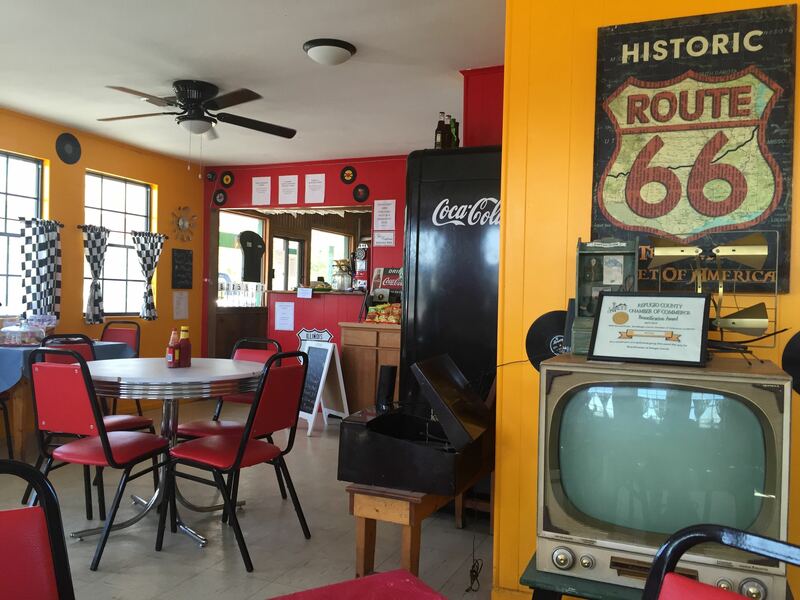 This cool little diner is very likely the birthplace of the tortilla burger, a creative solution born on a day when the kitchen ran out of hamburger buns. The rest is history. After weeks of waiting, my wife and I decided to swing by Woodsboro on our way from Katy to Corpus Christi. 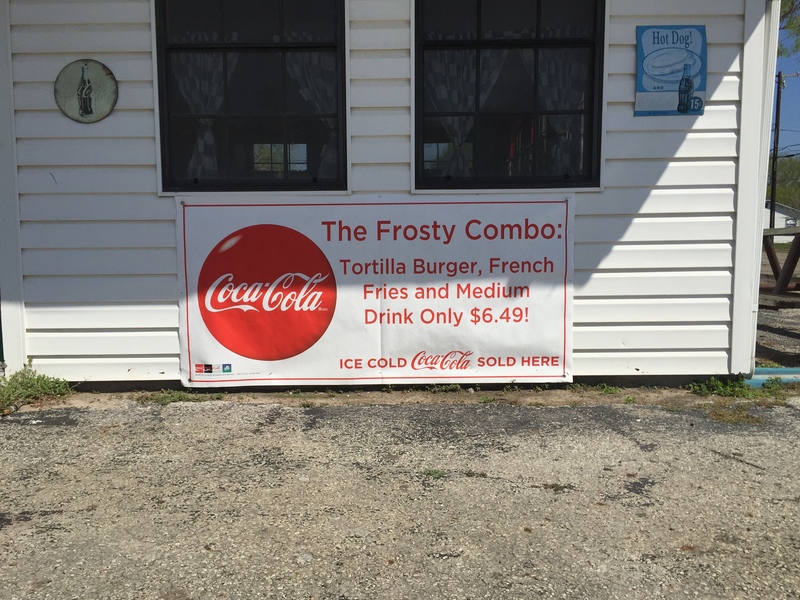 The first thing we noticed when we pulled in to the parking lot at The Frosty was the sign outside the building advertising The Frosty Combo — a tortilla burger, fries, and a medium drink for less than seven bucks. This is exactly why we were in Woodsboro. Once inside we were more than pleasantly surprised. To say that The Frosty is a clean diner would be an understatement. The place was immaculate. And the bathrooms, by the way, were every bit as clean as Buc-ee’s! But, I digress. Back to the reason we took this detour on our Spring Break road-trip — to eat a tortilla burger. We both ordered The Frosty Combo. Daniel Linares, the current and ninth owner of The Frosty, was in front of the stove. Since taking ownership, he has expanded the menu but keeps alive the tortilla burger tradition. I told Daniel that we had come all the way from Katy to try the tortilla burger for ourselves. He promised us a good dining experience — and he delivered on his promise. The thought of eating a burger that replaces buns with tortillas sounds counterintuitive. I mean, who slathers mustard on a lightly fried corn tortilla? But, counter-intuitiveness aside, the tortilla burger has endured at The Frosty because it actually works. The tortillas do nothing to rob the burger of its integrity but, in fact, contribute their own distinct flavor to enhance the entire burger experience. As for the first bite — surprisingly delicious. Who would have thought that a burger as crazy as this would be this good. The crispy, pepper-speckled fries were also tasty. Add a glass of tea with crunchy ice and this turned out to be a great meal. Cheryl and I are really glad that we stopped by The Frosty and hope to do so again. If you find yourself anywhere near Woodsboro, live adventurously. You owe it yourself to stop by The Frosty to try their tortilla-clad burger. As for me, this hybrid burger has definitely earned a place on my personal list of delicious burgers in the Lone Star State. The tasty tortilla burger — only in Texas! 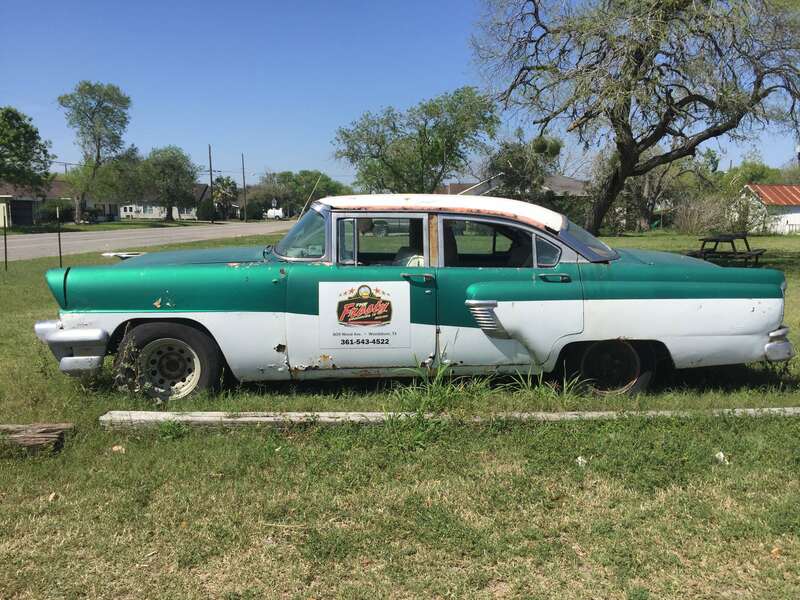 This entry was posted in Places To Eat and tagged The Frosty, Tortilla Burger, Woodsboro. Bookmark the permalink. 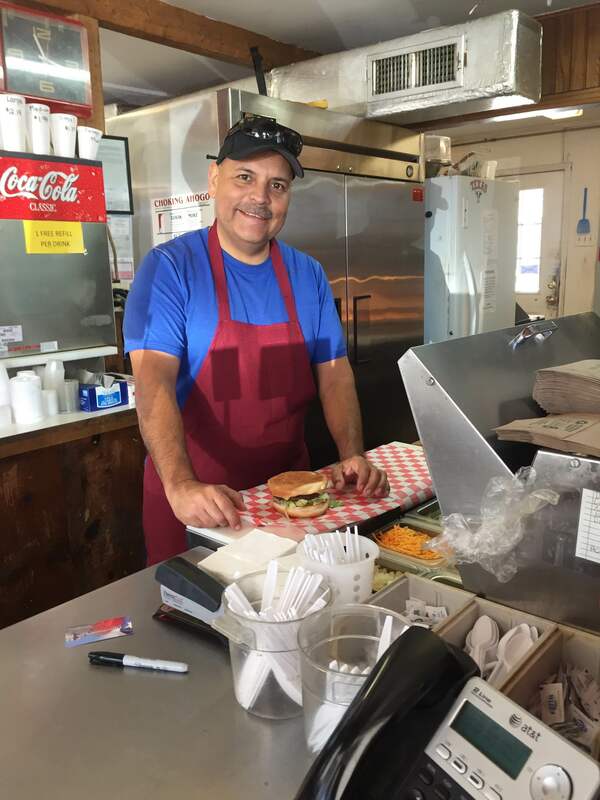 Although Frosty’s are delicious, Henry’s Mexican Food in Refugio Texas has also served tortilla burgers for over 20 years. Even further back than that, the Bowl a Rena in Refugio, (now closed) also used to serve them. Refugians believe that’s where the were invented. Felix, Sanchez, the manager and cook at the time, served his boss a hamburger on tortillas because he ran out of buns. Urban Legend? Maybe but that’s our story and we’re sticking to it! Thanks for the info, Rachel. Will have to check out Henry’s in Refugio. Regardless of where this fabulous burger originated, we are indeed fortunate to have such a tasty burger hybrid in the Lone Star State. Thanks for this info, Kenneth. How cool that Whataburger in Refugio served tortilla burgers. Refugio seems to be ground zero for this creative culinary creation. I agree the Tortilla burger was invented in Refugio, but I believe Ralph Williamson beat Felix Sanchez to it. We were eating Tortilla Burgers at the Whopper Burger back around 1964-65 or so. 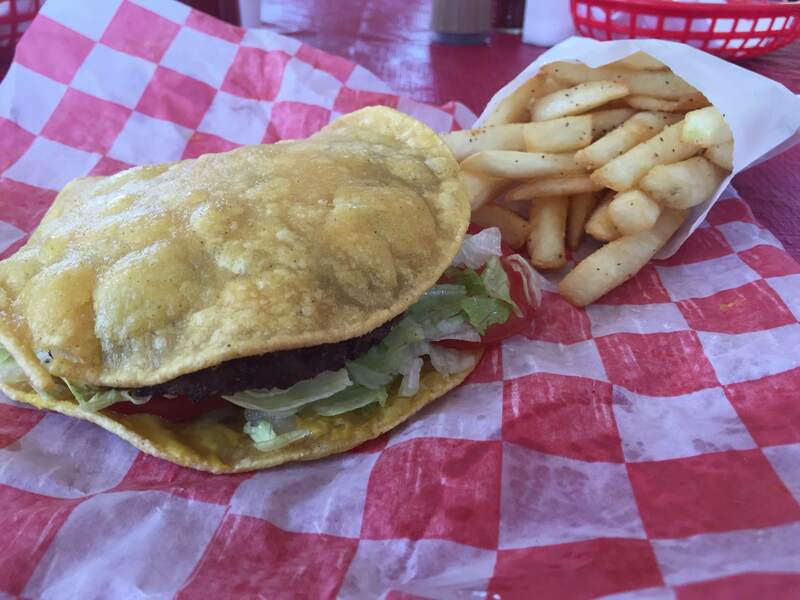 In any case–Refugio County is the birthplace of the Tortilla Burger! Thanks for this history, Laura. You are absolutely correct in pointing out that Refugio County is the birthplace of the Tortilla Burger. And those of us who love burgers are the grateful beneficiaries of this creative Texan invention. I can relax now. Hamburger integrity is secure. Tasty Taco in Sinton Texas and Dairy King in Taft Texas also have good tortilla burgers. Sinton also believes it was Ground Zero for tortilla burgers as well. I don’t know if we will ever know, but that only adds to the appeal if you ask me. Interesting stuff, Robert. It’s been fun to get feedback with bits and pieces of information about the possible origin of the tortilla burger. I’m just glad that places like The Frosty continue to make the tortilla burger available for a new generation of burger lovers. I was one of the owners of Tasty Taco in the mid/late 70″s and we were serving tortilla burgers than. It was started by the prior owner who may have served them ten or more years before then. So we are talking almost 50 years ago. Thanks for sharing this history, Kevin. Great to know that Texans have enjoyed this innovative burger for many years.